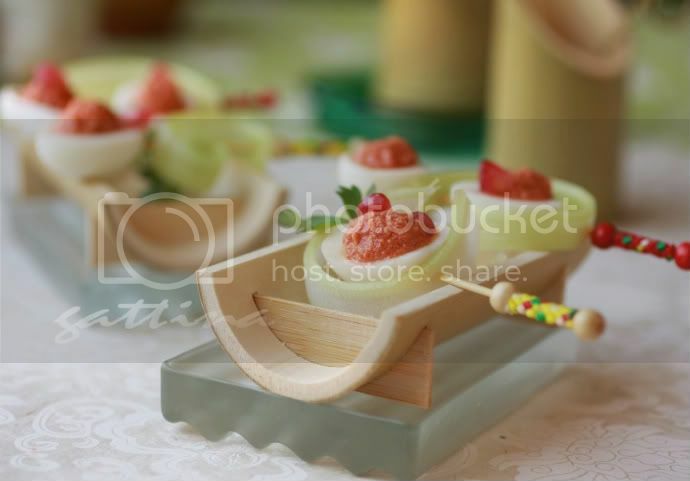 Skewer the munchkin eggs with a braided pick and serve them on a bamboo canoe, they instantly bring an elegant style to your party table. 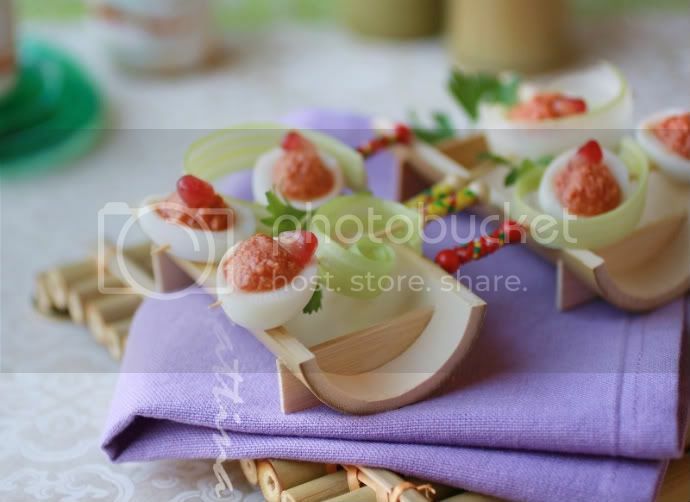 Egg is a very nutritional food, with its adorable appearance, devil egg becomes a popular appetiser. But the classic devil egg contains mayonnaise or salad dressing (usually more than 1 teaspoon in an half egg) which is entirely empty calorie, plus the cholesterol already inside the yolk, this appetiser can be a real devil. Take it in moderation?... I wish I always could, especially in a party, the chat's so fun the wine's so lovely, can I just free myself and not to count how many eggs I ate? So I've made this guilt-free version: the filling is chickpeas in spicy tomato sauce, with a touch of pomegranate. The (cooked) yolk won't go wasted, you can save them for making cookies, or add in a creamy sauce or in a cake batter. I'm totally fond of the tiny size of quail egg, use it instead of classic chicken egg, stick a few together with a decorative pick, no party lover can stop at one! Boil the quail eggs for 7 minutes. Once they're done, soak them in cold water for 2 miutes. Then remove the shell, use a very sharp knife to cut eggs into two halves, remove the yolks. Puree the chickpeas very well. Combine the chickpeas and tomato sauce, the ratio is totally up to you: more chickpea more creamier; more sauce more color more moist (my fav!). Spoon/pipe the filling into the egg white. That filling is very original! Great presentation too. Yummy! what is the chickpea / tomato sauce ratio? I think this would make a great app for an adult brunch. Sort of like a deconstructed, healthy bloody mary.